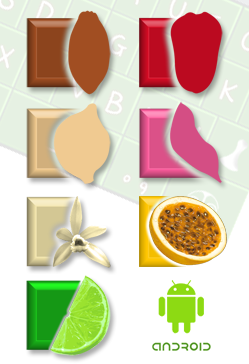 Huri Translations has developed The Polynesian Keyboard application for mobiles running Android 2.1 and up. Users no longer need to browse through a list of accented vowels to type macrons. Simply long-press on the vowel to macronize it! In many Polynesian languages and dialects, the apostrophe is needed to write glottal stops. Because they are frequently used and necessary to avoid confusion with other words, Huri Translations has integrated the apostrophe into the main set of characters of the Polynesian Keyboard so it's just faster and easier to write! When you start a sentence with an apostrophe, the next letter will keep the shift key on so you start with an Upper-case vowel directly after the apostrophe. Seven Polynesian delicacies to suit your taste! A longer pressure on the vowel and you've got the macron over! 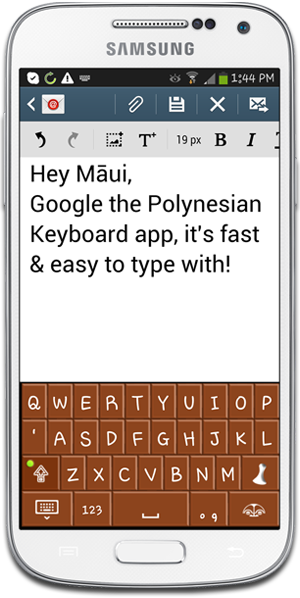 Get your favorite Polynesian Keyboard on your mobile! Most Polynesian alphabets have 5 vowels : A - E - I - O - U. The macron is a diacritical mark used to indicate a long vowel. What is the Polynesian Keyboard? 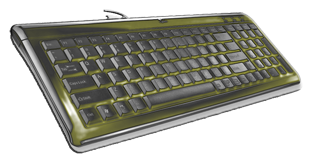 The Polynesian Keyboard is a usual English QWERTY keyboard with integrated macron function. How to install your Polynesian Keyboard? Go into your Control Panel, look for keyboard settings and add the Polynesian keyboard. Select the Polynesian Keyboard as your actual keyboard. If folder Keyboard Layouts doesn't exist, create it. How to place a macron on a vowel? What systems are supported with the Polynesian Keyboard? Download the Polynesian Keyboard now! THE POLYNESIAN KEYBOARD | The easiest tool to write macrons.